During the massacres, hundreds of thousands of refugees were fed, clothed, housed and cared for in camps and orphanages on the territory of present-day Syria, Lebanon, Jordan, Palestine, Israel and Egypt. For example, in 1922 an orphanage was set up in Aleppo that became home to 5,000 children evacuated mostly from Kharberd by Swiss missionary Jacob Kunzler. A number of Armenian villages also were set up by Danish missionary Karen Jeppe in cooperation with local authorities and the leaders of the Anaze Arab tribe Hajim and Mjim Pashas in northern Syria, the country that saw the largest inflow of Armenian refugees fleeing the Genocide. One of the most welcoming countries for Armenian refugees was Lebanon: tens of thousands of Armenians found shelter in Beirut, Zahle and other settlements. The Near East Foundation, founded as the American Committee for Armenian and Syrian Relief in response to U.S. Ambassador Henry Morgenthau's reports of governmental atrocities against Armenians in the Ottoman Turkey, operated orphanages in Antelias, Zouk Mikael, Jounieh and other places. Thanks to another Danish missionary, Maria Jacobsen, the famous “Bird’s Nest” orphanage was set up in Jbeil. Another country that became a safe haven for Armenian refugees was Egypt. Thus in September of 1915 a giant refugee camp was set up in Port Said for Armenians evacuated from Musa Dagh by the French Navy. Thanks to the camp, 4,058 Armenians from Musa Dagh survived, 1,563 of them children. Likewise, after Palestine came under British control in 1917 orphanages were set up there for Armenian children, including 5,300 children from Kharberd. Jerusalem was also an important place of rescue for Armenian orphans: in 1923, 250 orphans were sent from Jerusalem to Soviet Armenia, while 40 orphans were taken to Adis Abbaba to form the imperial orchestra. The list goes on. One hundred years later, Armenians are expressing their gratitude to the Arab people and other peoples of the Middle East. Valued at nearly $7 million, the 100 LIVES and Near East Foundation Gratitude Scholarship Program will provide children affected by conflict, displacement and poverty the opportunity to study at UWC network schools around the world, including in Armenia-based UWC Dilijan – an international co-educational boarding school currently hosting students from over 60 countries. 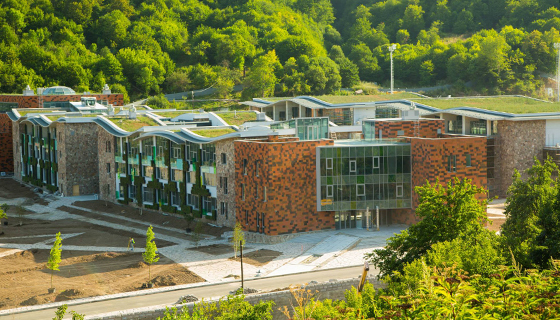 UWC Dilijan in Dilijan, Armenia. Just like 100 years ago, children are the most vulnerable victims of present-day turmoil in the Middle East. The majority of children displaced by war and poverty have no access to education. According to U.S. Fund for UNICEF President and CEO Caryl Stern, "there are currently more children on the move than before World War II.” UNICEF estimates that there are more than two million out-of-school children in Syria, in addition to 700,000 Syrian refugee children in neighboring countries. “By providing crucial access to education, we truly hope to be able to provide these children opportunities to have the successful future they deserve—much like the extraordinary work the NEF has been committed to these past hundred years,” says Armine Afeyan, daughter of 100 LIVES co-founder Noubar Afeyan. The program will be administered through the Scholae Mundi Foundation, which aims to provide students with opportunities to develop the knowledge, skills and attitudes needed to contribute to the international community and catalyze social change. Through its network of community-based organizations, NEF will provide local UWC selection committees with potential student referrals. The first recipients of the scholarship will be enrolled in UWC schools in 2016.